World famous percussionist Hossam Ramzy brings his Egyptian Orchestra to the UK next week as part of the Crowborough Arts Festival, Crowborough, East Sussex. The event entitled "The Spirit of Egypt" will take place on Friday 24th September 2010 at the Main Hall of Beacon Community College (8pm - Doors open 7.30pm Tickets £13.50 unreserved). Hossam Ramzy and his Egyptian Orchestra will be joined by the enchanting and dynamic dance visions of his Brazilian wife Serena Ramzy and other guest dancers. 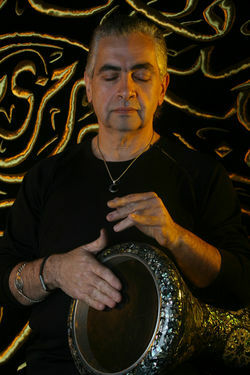 Ramzy is the best known Egyptian musician in the world and has numerous cds to his credit besides having performed with a wide range of well-known world and rock musicians. This show presents many different aspects of Egypt: classical music that touched the hearts of generations past, mixed in with improvised “Baladi” (the urbanized folklore of the countryside) as well as the lure of the ghetto. For more information contact Allyson Cook on 01892 662673. Tickets also available on the door on the night of performance.